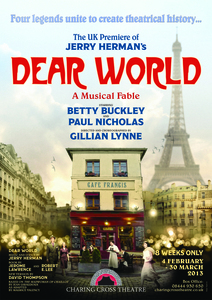 Dear World is a joyous 'good vs evil' musical romp set on the streets of Paris. The show is Jerry Herman's adaptation of Jean Giraudoux's play The Madwoman of Chaillot. After years on Broadway, this is its first London outing. Countess Aurelia (Betty Buckley), is the owner of the Café Francis, a historical Parisian bistro which comes under threat from unscrupulous businessmen who believe they have discovered oil directly below the café. They will stop at nothing to push Aurelia aside, demolish her café and home and drill for oil. The three main businessmen who are known as 'the Presidents,' are portrayed by Peter Land, Jack Rebaldi and Robert Meadmore. They're basically pantomime villains, singing songs about lusting after money, dreaming about tearing down historic Parisian landmarks and replacing them with oil rigs plotting the demise of the lovable but highly eccentric Aurelia. Eventually, as you would expect with this kind of show, the forces of good win out. Aurelia along with the able assistance of the equally eccentric 'Sewer-Man' (Paul Nicholas) and a host of other locals lead the three Presidents and their co-conspirator 'the Prospector' (Anothny Barclay) into a trap. The play is highly kitsch and is clearly intended as a bit of fun rather than a serious musing on the power of greed. It's peppered with lively songs, that put the spotlight on each main character at least once. Countess Aurelia takes the lead on several occasions as she sings of her lost love who still haunts her as well as her struggle against the powerful businessmen. Betty Buckley steals the show, with her glittery, charming and highly eccentric portrayal of Countess Aurelia. Paul Nicholas also puts in a noteworthy performance as Sewer-Man, who acts as a fantastic foil for Buckley. The show maintains a lively pace and switches regularly between spoken word and song and dance numbers. The action takes place on a beatufully constructed rotating set, that goes from being the front of Café Francis to the interior of Aurelia's home, where along with her accomplices she plots the downfall of the businessmen. Dear World is never going to be everyone's cup of tea. It is simultaneously kitsch, farcical and full of whimsy. However, if you're looking for a show that is brilliantly staged, features numerous excellent performances and is packed with entertaining songs and comedic moments, then you can't go far wrong with Dear World. Dear World is at the Charing Cross Theatre until March 30. Evening shows are at 7.30pm plus weekend matinees at 2.30pm. Tickets are £15-£42.50.